This past year, more than 10 million caring citizens donated gently used items such as clothing, furniture, appliances and toys to The Salvation Army. Your tax-deductible contributions are then sold through our popular Family Stores around the country. Proceeds from the sale of donated items help fund our Adult Rehabilitation Centers, which provide substance abusers and others struggling with various forms of life issues with the necessary tools to re-enter society and live productive lives. Call 1-800-SA-TRUCK (1-800-728-7825) to discuss a free pick up of your clothing, furniture or household items or to find out the nearest drop off location bin. Due to the high volume of donations received and the limited number of trucks available to respond to pick up requests, The Salvation Army cannot schedule same-day pick ups. While we will try our best to work with your schedule, pick up appointments are usually scheduled to take place within 7-14 days from the time of the initial phone call. However, schedules may vary based on location, time of year and the number of trucks available in your area. Due to laws and other regulations, there may be some items that we cannot accept as donations. For instance, tires, paint, windows, doors, water heaters, bathroom fixtures, and water beds are often problematic. 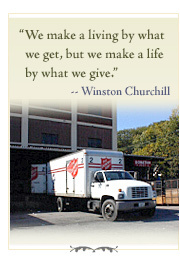 If you have any questions about any of the items you wish to donate, please call 1-800-SATRUCK. Our representatives will be able to advise you based on your location.